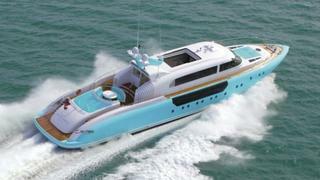 Burgess have been appointed listing agents for sale of the 35 metre motor yacht Moon Goddess. Styled by Espen Øino, Moon Goddess was custom built in carbon fibre/kevlar epoxy by Danish Yachts to DNV class and delivered in 2006 with a refit in 2011. Her construction material allows her to boast a very strong, lightweight hull and fast performance. With a saloon on both the lower and upper decks, guests are spoiled for comfort and choice. The retractable saloon roof on the main deck gives an expansive, bright and open ambience within a modern interior designed by Francois Zuretti. MCA compliant, she sleeps six guests in a full beam master suite and two twin cabins, all with en suite shower facilities. Powered by twin MTU 4000 M90 series engines driving twin Hamilton water jets Moon Goddess notches up a thrilling 43 knot top speed and has excellent manoeuverability. On display at the Miami boat show, Moon Goddess is asking $6,150,000.